Heaney reflects on the ‘meaning’ of the portrait of himself exhibited in the National Gallery of Ireland, focusing on a local-colour prop that does not actually appear in the finished panel. Involuntary memory (shadow boost) has brought chesnuts into his mind: the random act of handling a loaded basket has conjured up a hazy, ill-defined occurence (giddy strange assistance) swinging it revealed an interplay between gravity and weightlessness. He considers the dynamic variation of mass and momentum (lightness … diminish … actual weight), picks out the split second at the apex of the lift when hands feel no pull (unburdened), as if left behind (outstripped), surprised (dismayed), redundant (passed through). Then, just as unexpectedly, comes bounce-back (rebound), gravitational downthrust, and counter force comeback that confirm Heaney was involved (ratifying you). He dredges up the properties of the iconic basket of chestnuts, each one part of the same team (really solid gather-up), in-place and shining (all drag and lustre), sumptuous and swollen (opulent and gravid), colour-rich (golden-bowelled as a moneybag). He would have liked them to be painted to learn what value the artist’s vision (see beyond them) and palette (pigment) might have added or to learn how the artist might have felt (what the reach of sense despairs of) if the finished representation fell short of expectation (fails to reach it) or did not match his intended deftness (the thwarted sense of touch). Focus moves to the painter and the moment (Edward Maguire … autumn of 1973). 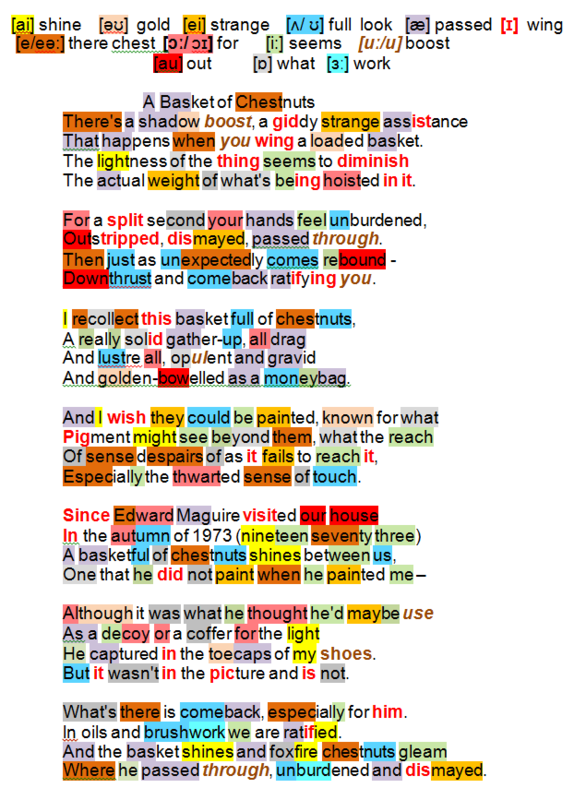 Heaney chuckles … Maguire had requested the chestnuts possibly as an inducement to attract him (decoy) or as a mix-and-match of colour and shine (a coffer for the light) reproduced in his footwear instead (captured in the toecaps of my shoes). As for the basket, Maguire left it out! It has no recorded existence (is not). Maguire’s comeback is the finished portrait in the Ulster Museum, where, like poets, creative spirits live on by what survives them (in oils and brushwork we are ratified). The iconic basket-in-the-mind has lost nothing (the basket shines and foxfire chestnuts gleam). Heaney has recorded in a poem for posterity the short time when Maguire was part of his life (passed through), unhindered (unburdened) and downbeat (dismayed). The Shiver from from District and Circle of 2006 highlighted Seamus Heaney’s interest in the dynamics and physicality associated with a farmyard sledgehammer. He demonstrated similar interest in the ‘scientific’ properties in play when handling a pitchfork in Seeing Things. Heaney commented further on his inability to relax totally in Edward’s presence and Maguire’s manner, unfailingly friendly and fiercely funny, and his fondness for Guinness at any time of the day.